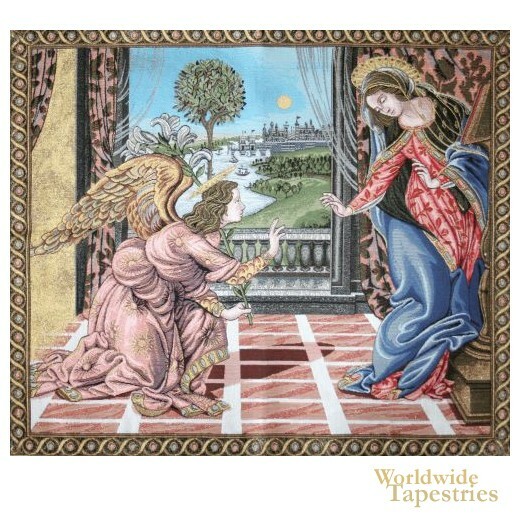 This tapestry "Annunciation Boticelli" shows the work of Sandro Botticelli (1445-1510), early Italian Renaissance painter. Renowned for his beautiful religious works, Boticelli was part of the Florentine school or artists in the 15th century under the patronage of Lorenzo de Medici, which included Fra Angelico, Donatello and Michaelangelo. Here we see the Annunciation to the Virgin Mary, the original of which was created around 1489, commissioned by the Florentine convent of Cestello now known as Santa Maria Maddalena de'Pazzi. Here we see the angel Gabriel telling Mary that she will conceive a Holy child from the Holy Spirit, and the name that she will give her child. The Annunciation is a key topic in Christian art and tapestries. This work by Boticelli is beautiful in its detail as well as composition. We see the striking and elaborate garments of the archangel and the Virgin, as well as a lush gardens, city and river as a background. This religious Renaissance tapestry "Transfiguration of Jesus" is lined and has a tunnel for easy hanging. Dimensions: W 29" x H 25"